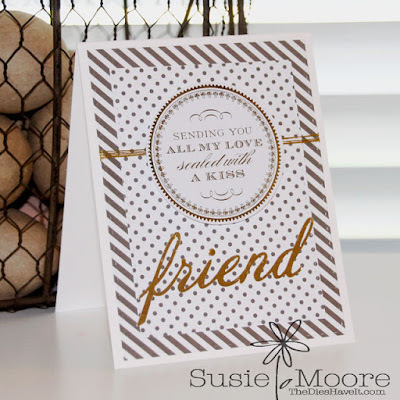 I've been working with some gold foil again from the Minc Mini Kit. I love all the embellishments in the kit that can be foiled with a variety of colors. This time I chose gold for my pretty round focal point. Then I foiled the 'friend' which was die cut from toner paper and attached it below. For a small extra accent, I wrapped some gold thread around the front of my card front and I love the final result. I hope you have a wonderful day. I'll see you again tomorrow!